58 Commercial Real Estate & Properties in Warana are listed in 3 categories. We have 48 Industrial Warehouses Sale & Lease , 5 OfficesSale & Lease and 5 Retail ShopsSale & Lease . Well presented office warehouse of 343sq m (approx) ideally located in the Warana commercial precinct just off Nicklin Way and Kawana Way. + Quality air conditioned offices over two levels + Presentable warehouse of 236sq m (approx) + High clearance roller door access + Ample parking + Rear covered storage area with roller door access Call or email Matt Marenko or Louisa Blennerhassett to inspect the property or find out about other suitable options. Our team is strategically located in two offices across the Sunshine Coast region and is ready to handle your commercial, industrial and retail property needs today so call or email now. Solid factory of 188sq m (approx) ready to go, ideally located on Production Avenue in Warana's industrial hub. Direct access to Nicklin Way and Kawana Way. + 188sq m (approx) factory + 3 phase power supply + Air conditioned office + Roller door access + Rear parking for four cars Call or email Matt Marenko or Tallon Pamenter to inspect the property or find out about other suitable options. Our team is strategically located in two offices across the Sunshine Coast region and is ready to handle your commercial, industrial and retail property needs today so call or email now. Solid industrial property of 424sq m (approx) in well presented development in the heart of the Kawana industrial precinct just off Kawana Way and within close proximity to Sunshine Motorway and Nicklin Way. + High clearance warehouse + Ample 3 phase power outlets + Front and rear roller doors for air flow + Hi bay lighting + On site parking + Can be leased with neighbouring office or tech area of 172sq m (approx) + Also available for sale at $850,000 plus GST (if applicable) Call or email Matt Marenko or Tallon Pamenter to inspect the property or find out about other suitable options. Our team is strategically located in two offices across the Sunshine Coast region and is ready to handle your commercial, industrial and retail property needs today so call or email now. Versatile warehouse with large office or clean area of 596sq m (approx) in well presented development in the heart of the Kawana industrial precinct just off Kawana Way and within close proximity to Sunshine Motorway and Nicklin Way. + High clearance warehouse + Ample 3 phase power outlets + Front roller door plus rear roller door for air flow + Office split over two levels with suspended ceilings throughout + Air conditioned and recessed fluoro lighting + Fitted with reception, multiple offices and open plan areas + Hi bay lighting + On site parking Call or email Matthew Marenko or Tallon Pamenter to inspect the property or find out about other suitable options. Our team is strategically located in two offices across the Sunshine Coast region and is ready to handle your commercial, industrial and retail property needs today so call or email now. High Span Tilt Panel Warehouse Premier Circuit $53,000 P/A + Outg..
Four units remaining for lease (2, 3, 11 12) Sizes from 192m2 to 207m2 with the ability to combines Lots 2 3 or 11 12 Container high roller door access at 6.5 meters separate personal access door Two wide driveways and ample onsite car parks 3 phase power to each shed LED lighting Internal amenities with onsite shower Well presented office, with ample power data points Minimal body corporate fees/low outgoings with discounted solar power agreements available Ray White Commercial North Coast Corridor Group are pleased to present this brand new industrial complex of 12 units for lease with a mix of office warehouses from 192m2 to 207m2 with the ability to combine if required. There are 4 units remaining for lease in the complex (Lot 2, 3, 11 12) all with high clearance roller doors at 6.5 meters. The complex is located in the heart of the Kawana industrial precinct, in close proximity to Sunshine Motorway, Kawana Way Nicklin Way and less than 20 minutes to the Sunshine Coast Airport Bruce Highway. Contact our marketing agents to arrange your inspection or for our Information Summary detailing all available units, pricing and sizing details. 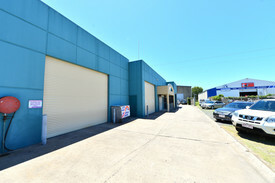 188m2 High clearance roller door Open plan warehouse with small office/showroom Rear covered storage area with roller door access Internal amenities Three phase power Exclusive car parking available at rear of building for 4 cars, ample street car parking Convenient located between Nicklin Way, Kawana Way and only minutes to the Sunshine Motorway Available immediately, previous tenant has now vacated Contact our marketing agent Emily Pendleton for further information or to arrange an inspection. Rare Find In Kawana - Office Warehouse With Bonus Mezzanine $690,000 + GST (if applic.. This is a very rare opportunity to purchase an office warehouse in the Kawana/Warana industrial precinct located just off Kawana Way and moments away from Nicklin Way and the Sunshine Coast Motorway. + 348sq m (approx) high clearance warehouse + Includes air conditioned office + Container height roller door access + Bonus mezzanine area + Ample on site parking and loading area + Also available for lease Call or email Matthew Marenko or Louisa Blennerhassett to inspect the property or find out about other suitable options. Our team is strategically located in two offices across the Sunshine Coast region and is ready to handle your commercial, industrial and retail property needs today so call or email now. Total NLA: 94m2 In prominent location with exceptional drive by traffic flow This shop also provides rear roller door access In older complex with well establishes businesses Very affordable and now For Lease: $19,200pa + Outgoings + GST For more information or to arrange an inspection please contact Marketing Agents: Brenton Thomas 0407 693 467 brenton.thomas@raywhite.com Approx. Solid factory of 188sq m (approx) ready to go, ideally located on Production Avenue in Warana's industrial hub. Direct access to Nicklin Way and Kawana Way. + 188sq m (approx) factory + 3 phase power supply + Includes office / showroom area + Roller door access + Rear parking for four cars + Rear covered storage area with roller door access Call or email Matthew Marenko or Louisa Blennerhassett to inspect the property or find out about other suitable options. Our team is strategically located in two offices across the Sunshine Coast region and is ready to handle your commercial, industrial and retail property needs today so call or email now. Ray White Commercial Norther Corridor Group are pleased to present. Located within the Sunshine Coasts' premier industrial estate, this unit offers the perfect blend of functionality modern appeal. Ideally suited for a business looking to commence immediate operations, the property provides: High clearance, clear span warehouse Roller door access 4 exclusive car spaces Contact our marketing agents Michael Shadforth Jordan Hayes to arrange your inspection today. Located within the Sunshine Coasts' premier industrial estate, these two units offer the perfect blend of functionality and modern appeal. Ideally suited for a business looking to commence immediate operations, the property provides: High clearance, clear span warehouse Roller door access High quality office component Mezzanine level converted to office 6 exclusive car parks Unit 10 424m2 Unit 11 172m2 Total 596m2 $65,560 P/A Net Contact our Exclusive marketing agents Michael Shadforth Jordan Hayes for further information or to arrange your inspection. Modern tilt slab construction, extra high door access High exposure site Ample parking 242sqm ground floor area including air conditioned reception, managers office, kitchen, toilet and shower Large mezzanine of 117m2 for storage or additional floor area Work bay able to take 4 vehicles plus Located on Premier Circuit, just off Kawana Way in the newer Warana Industrial Estate minutes to the Sunshine Coast Hospital Premier Circuit in Warana has appealed to a variety of national companies with its corporate finish and unbeatable location, with easy access to the Bruce Highway and a 90 minute drive to Brisbane Airport CBD. Contact our exclusively appointed leasing team for further information to arrange an inspection.